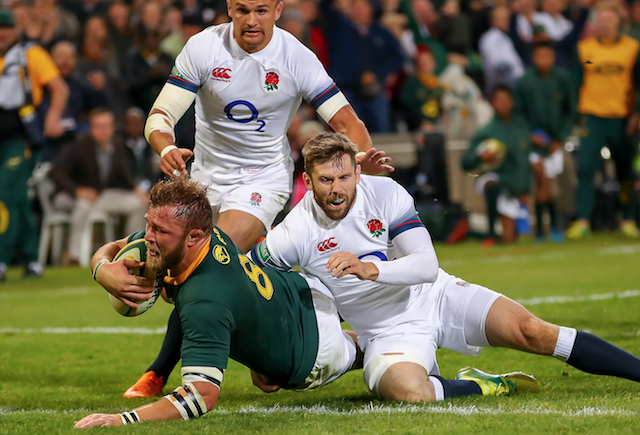 The Springboks will be forced to make at least five changes to their starting lineup for Saturday’s clash against England at Twickenham, writes CRAIG LEWIS. The upcoming clash on 3 November falls outside of the international window. It means that the Bok players based in England and France will not be available this weekend, and effectively that a weakened team will head into action. Influential scrumhalf Faf de Klerk is duty bound to his English club, the Sale Sharks, and was not named in the touring squad on Saturday. Although Willie le Roux (Wasps) and Francois Louw (Bath) were named in the Bok group, they will not be available this weekend. Franco Mostert has found himself in the middle of a contractual dispute between the Lions and Gloucester, and will not be considered this week, while Cheslin Kolbe (Toulouse) is also out of selection contention. All five of these players started in the Boks’ last Test against the All Blacks at Loftus, which saw the hosts slip to an agonising two-point defeat despite dominating proceedings for most of the encounter. The Springboks will not have the luxury of continuity for this weekend’s end-of-year tour opener. In fact, far from it. The absence of Le Roux means that Damian Willemse could be set for his first Test start, although part of the reasoning behind Gio Aplon’s recall was in order to provide another experienced option in the back three. As it is, young S’bu Nkosi is likely to return to the right wing as a replacement for Kolbe, and he will be determined to produce a performance that makes it particularly difficult to displace him from the run-on XV for the remainder of the tour. At scrumhalf, Erasmus will need to make a call between youngsters Embrose Papier and Ivan van Zyl, who have less than 10 caps between them. Louis Schreuder remains the third scrumhalf in the squad. In the backline alone, these all are all significant changes, while it can’t be forgotten that potential first-choice outside centre Lukhanyo Am remains unavailable due to injury. At No 8, the absence of Louw has been offset by the availability of fit-again Warren Whiteley and return of Duane Vermeulen, who is likely to start his fourth Test against England this year. With Mostert out of the reckoning, the Boks will need to weigh up the risk of rushing Lood de Jager straight back into action or shifting Pieter-Steph du Toit from flank. Alternatively, RG Snyman could play out of his preferred position as a No 4 lock. It’s all a bit tricky as the Boks don’t have another specialist blindside flank in the squad should Du Toit vacate the No 7 berth, with Jean-Luc du Preez having been somewhat strangely omitted for this tour. The current selection dilemma should ease when the Boks take on France when the Test window opens next weekend, and coach Rassie Erasmus suggested they would just need to roll with the punches this Saturday. ‘When we agreed to this Test match [outside of the international window], we knew it was going to be this way. There are some positive spin-offs financially, but that doesn’t worry me, it’s more about having another Test match before the World Cup [to test out a few things].